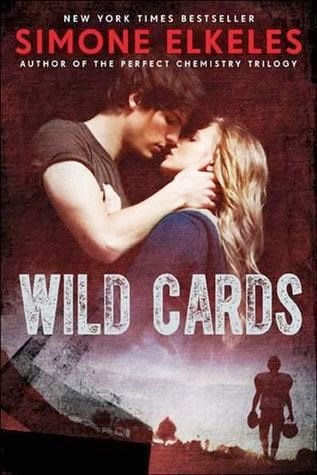 I was hoping to enjoy Wild Cards by Simone Elkeles more than I did. While I mostly enjoyed her previous books about the Fuentes brothers, I didn't love them as much as others seemed to. The thing about Wild Cards that made me think that I might enjoy it better is that it is the first in a new series based around a football team that has a girl captain. Girls playing sports in YA? Sign me up right now. There is something particularly addictive about the way in which Simone Elkeles writes. Once I started Wild Cards I really couldn't put it down until I'd finished. I think my problem with the book is that it sometimes feels as though the characters are trying too hard to be certain things. Like the Fuentes brothers being hardass gangsters - I didn't believe it. And in this, I just didn't feel like Ashtyn was who Simone Elkeles made her out to be. I couldn't relate or emotionally connect to her because she didn't feel real to me. I appreciated the fact that she's trying to do something that goes against what's considered gender normal but to me it didn't quite ring true. It was a different story with Derek. Again, his pranks and couldn't-care-less attitude at the beginning didn't feel like it breached the surface of realness, but later on in the story with his relationship with his step-family, I felt like I was really seeing his truth. I think the grief that he felt over his mother was apparent but I was left feeling slightly bemused towards the end of the book when a secret of Derek's past is revealed. It came from nowhere. Derek and Ashtyn were cute together and I liked seeing how their relationship progressed. They both had things to work through and I mostly enjoyed working through them together. I just wish that there had been more of an emotional connection to them both as characters. I liked Derek's relationships with his little brother and his step-mom and I'd have liked that to have been delved into more. Same with Ashtyn's life on the football team and her involvement with the other football players who appeared loyal and devoted to her. We're told of these brilliant friendships between Ash and the team but I didn't quite feel or believe it. All in all, Wild Cards was a very enjoyable way to spend an afternoon. It was a cute and sweet love story that I'm sure most readers will love more than I did. I am glad you liked this one. It is a shame you didn't like it as much as you thought you would. I hate it when that happens. That it did! :) I hope that you love it more than I did as well.